Sympathetic drainage of the axillary region and neck stimulates pranic energy flow also the cervical ganglions and brachial plexus currents. It clears head congestion in colds, etc. The doctor stands on one side and grips the axillary muscles and the neck muscles on one side with gentle squeezing alternating rhythmic movements. It gives a good response over the upper left rib area of the 3d [3rd, third], 4th [fourth] and 5th [fifth] ribs where digestive and stomach reflexes accumulate and are often mistaken for heart pains. On the right side these areas give gall bladder and liver reflexes and show chemical disturbance and a lack of oxidation. 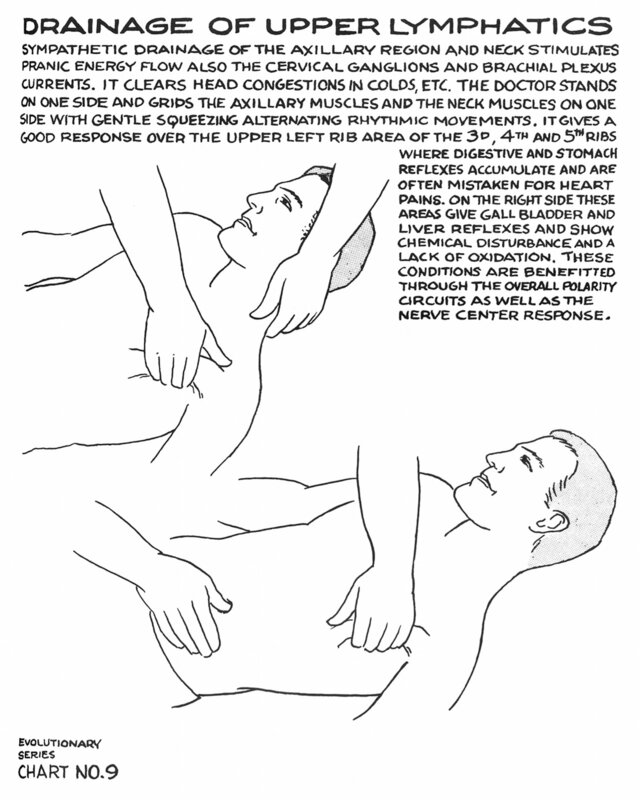 These conditions are benefitted through the overall polarity circuits as well as the nerve center response.